When the Oklahoma City–based energy company SandRidge was formed, it acquired several pieces of somewhat run-down property downtown, including a 30-story tower designed by Pietro Belluschi and a structure dating from the 1920s known as the Braniff building. Rather than selling the properties and building new, the company adopted a more layered urban strategy, including renovation, new construction, landscape, and urban design to create a corporate campus nestled in the city called SandRidge Commons. The company approached Rogers Marvel Architects to create an ensemble of buildings and outdoor spaces that could add to the city’s burgeoning urban revival. “I think the strategy is both opportunistic and enlightened,” said Robert Rogers, principal at Rogers Marvel. With a team that includes the local firms Elliott + Associates and Frankfurt Short Bruza and the Chicago-based Hoerr Schaudt Landscape Architects, Rogers Marvel will renovate the Belluschi building, re-skin the side of the Braniff building to open it up to a renovated plaza next door, and build a new employee facilities building with an auditorium, child care, and fitness center, including a rooftop basketball court. Hoerr Schaudt, working with the city and Elliott, will also renovate Kerr Park across the street with a sloping lawn and more trees. “Our practice is about the overlap between architecture, landscape, and urban design, so it’s kind of an ideal project for us,” Rogers said. 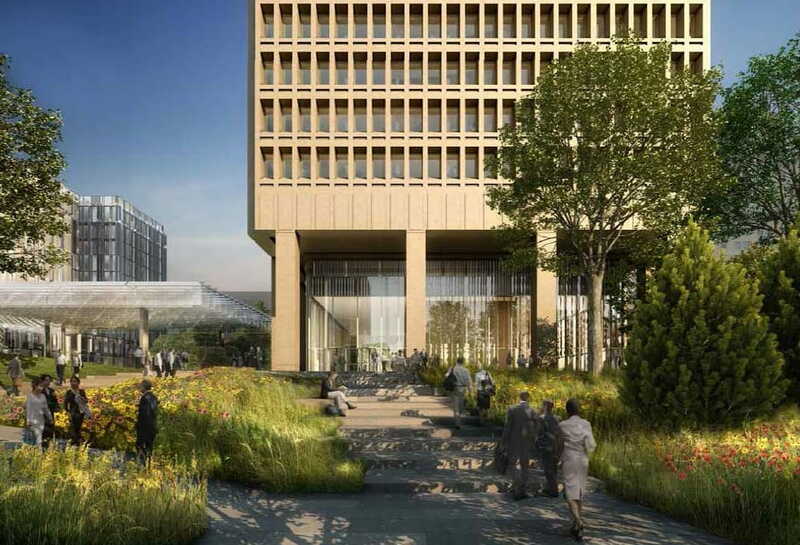 At Kerr Park across the street, the landscape architects hope to soften what is currently mostly pavement, and they emphasize it will not become a corporate playground. “We’re not taking over the park,” he said. 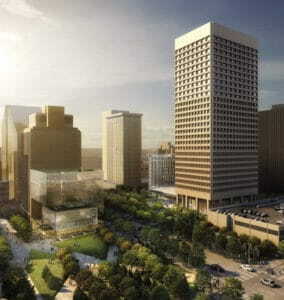 The $100 million SandRidge Commons project is one of several going on in downtown Oklahoma City. According to Rogers, there are more than $3 billion in public and private projects planned or underway in downtown Oklahoma City. Many of these projects were made possible through a one-cent sales tax for downtown projects, known as Metropolitan Area Projects, including public facilities like streetscapes, parks, and libraries.